Labour's tax plans make the front pages of a number of Sunday's papers, with the party's focus falling on those at the higher end of the pay scale. The headline in the Sunday Telegraph reads: "Labour plans to hammer workers on £80,000". It says Jeremy Corbyn's team has confirmed what it calls "a savage cash raid on the top 5% of earners". The Observer also leads on the tax story, saying the extra cash raised will go towards the NHS and education. The paper says Mr Corbyn and his shadow chancellor, John McDonnell, hope the policy will convince voters that they are serious about their determination to create a more equal country. But it warns that the move could meet resistance among Labour MPs representing wealthier parts of the country. The Sunday Times says the move is a bid to "shore up the party's core support". 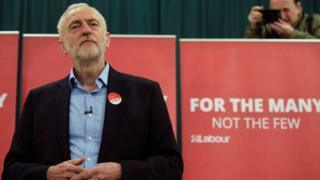 According to the paper, senior Labour officials say Mr Corbyn's team have given up hope of winning the election and are instead focusing on driving up the party's vote share in a bid to save the Labour leader's job. The Times claims sources inside the campaign will argue for Mr Corbyn to keep his job if he can match the 30% Ed Miliband won at the general election two years ago, regardless of how many seats are lost. However, the Sunday Express claims that Mr Corbyn could be at risk of losing arguably his most important backer, Unite boss Len McCluskey. The paper says the head of Britain's biggest union is giving financial backing to more moderate Labour MPs in an attempt to build bridges after "backing the wrong horse". Despite coming under pressure following disappointing local election results, Mr Corbyn remains defiant, attacking Theresa May in the Sunday Mirror. Writing in the paper, he accuses the PM of hiding from voters on the campaign trail, and challenges her to face him in a TV debate "anytime, any place, anywhere". Even if Mrs May does not change her mind about facing Mr Corbyn in front of the cameras, the Sunday Telegraph says that there may yet be what it calls a potential "dramatic twist" in the run-up to the election. The paper reports that more than a dozen former Conservative MPs - many of whom are standing for re-election - will be told whether they will face charges for breaking election rules over campaign expenses in the 2015 election. According to the paper, some Westminster figures think it could be a bombshell comparable to the FBI revealing it was reinvestigating Hilary Clinton's emails just days before the US election - a move that is thought to have helped Donald Trump clinch victory. The Mail on Sunday's front page headline reads: "Fury over BBC paternity slur against Harry". It says the drama King Charles III, to be shown on BBC Two on Wednesday, includes what it calls a "cruel" and "salacious" scene in which a character questions whether Prince Charles really is Prince Harry's father. A BBC spokesman points out that the programme is an adaptation of "an award winning, critically acclaimed and fictional play". Meanwhile, the Sunday Times says there has been an "explosion of wealth" fuelled by a "Brexit boom" in its annual Rich List, which features more billionaires than ever before. The paper says the "astonishing strength" of the list defies expectations that wealth creation would stall in the run up to last year's EU referendum and then crash after the vote for Brexit.